MIAMI (CNS) — After spending a week with adults and Catholic school children in the hurricane-impacted Florida Panhandle, one mental health professional noted how the Christmas season is a mixed blessing for survivors of natural disasters. “Right now the holidays are working in two different ways — both as a distraction and an underlying stress factor for parents both emotionally and financially but in another way it is good thing kids are looking forward, knowing that Christmas is coming and it is something else to think about,” said Claudia J. Gomez-Cardona, is a regional director of counseling for Catholic Charities of the Archdiocese of Miami. Gomez-Cardona and other Catholic Charities licensed mental health counselors from around South Florida spent the first week of December offering therapy and faculty training to hard-hit areas of Northwest Florida following this year’s unusually strong storm there. 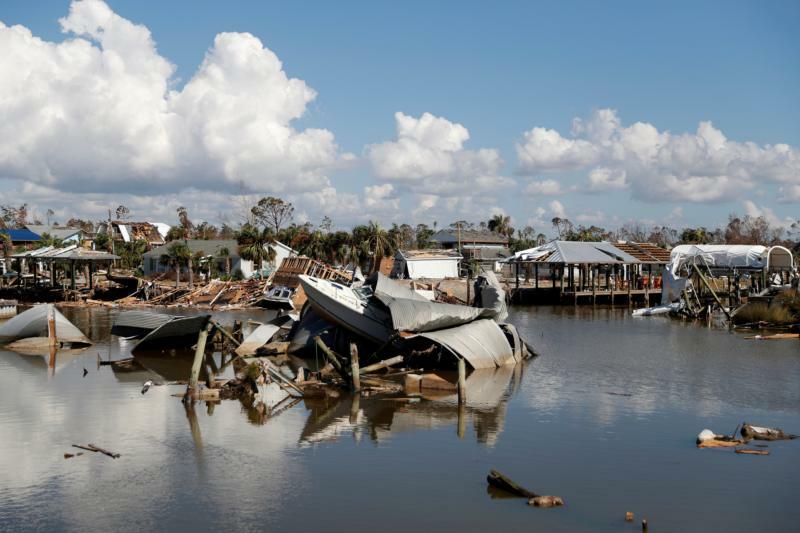 Hurricane Michael’s Oct. 10 landfall brought near Category-5 strength winds when it came ashore at Mexico Beach, near Panama City on the Florida Gulf Coast. The visiting mental health team initially expected they would engage more traumatized adults at one of the parishes most impacted by the storm but found themselves more useful by reaching out to parents, students, faculty and staff at one Catholic elementary school which has absorbed the entire student body of another school which closed due to Hurricane Michael. St. John Catholic School in Panama City suffered catastrophic wind and rain damage and is hosting classes at nearby St. Bernadette Parish for the foreseeable future. Much of the impacted region remains without power and clean water; the storm’s death toll rose to at least 29 in Florida alone and a total of 39 across the Southern United States. Gomez-Cardona said she and her team went from classroom to classroom and began easing into a series of conversations about the hurricane, listening to the youngster’s stories and encouraging the younger children to simply draw a representation of their feelings and memories of the storm. “The kids really needed this; it is amazing it was how they shared their feelings and how scared they were from the hurricane,” Gomez-Cardona told the Florida Catholic, newspaper of the Miami Archdiocese. The team met separately with school faculty and staff. The Christmas and Advent season, she noted, may be a time of joy and good feelings but also be a cause for more stressful triggers for those displaced families who realize there won’t be a Christmas tree in their own home this year. For others, the season will bring a pleasant distraction for the short term, only to find their new reality will quickly bring them back down to earth in the new year. — Start with the spiritual component of Advent and stay focused on what Christmas is really about. Stay in the present moment and see what you need to do and then do what you can with those things that you control. — If there is something beyond your control, pray or talk to others about it, do some discernment and try to step back and focus on the things you can be grateful for. Focus on one positive thing each day. — Even after fostering a sense of gratitude understand that everyone has problems and should remember life is not perfect but still make a point to focus on the blessing of good health or one’s children, and then expand on that, write it down, call someone and tell then you are grateful. — Get out into the community, join activities, be a little more open with people who want to help you or love you and don’t stay isolated. — For some, there may be feelings of suicide and be on the lookout for family and friends who may be feeling suicidal. Gomez-Cardona said other mental health teams from Catholic Charities agencies around Florida have continued to stay in the region in order to move from group therapy opportunities to personalized counseling with students and adults in the Panama City area. Many of the staff from St. John Catholic School in Panama City have considerable problems of their own that they haven’t had time to address. It also was noteworthy to hear youth from first grade to eighth grade expressing a lot of gratitude to the emergency responders and post-hurricane workers in the community who were putting things back together in the Panhandle, she added. Gabe Tischler, who is working full time on the Hurricane Michael response for the Tallahassee-based Florida Catholic Conference following the storm, has noted that Catholic Charities entities in the region have distributed some $6 million in aid, services and donations since the storm, and that St. Dominic continues to serve some 2,500 families daily. It is expected that the project may continue unabated well into next year.